Monsoons in Delhi aren’t really the most enjoyable, but then as Delhiites, we know how to turn that around, right? A pakoda and chai combo can fix those monsoon blues right up. So, check out these pakodawalas in Delhi if you haven’t already (you can thank us later!). PS. If you're a Gurgaon dweller, we have a list for you as well. Check it out here. Always crowded, this place makes crazy sales throughout the day. What makes it so popular? The sheer variety of pakodas, and all of them prepared hot for you. Be sure to try out the gobhi and pyaaz pakodas (we love the paneer ones too). If you want more out of Nehru Place than just Epicuria and all its fancy food, head to this place. The pakodas don’t feel too oily, and are just as delicious as any of the other places on this list. No one does fish pakodas better than this place. Sole, Surmai, Sungara; you name it, and they have it. The pakodas taste great, and so does the amazing mint chutney they serve with them. This small pakoda shop is so popular that this entire corner of the Lajpat Nagar market is known as Pakode Wali Gali (ask any vendor and they’ll point you to it). Take your pick from their aloo, palak, paneer, pyaaz, mirchi and gobi pakodas (we can vouch for them all). Right opposite the mandir in the Mandir Wali Gali, this seller serves crunchy and piping hot pakodas of aloo, gobhi, pyaaz, mirchi, moong ki daal, baingan and even soya. Coupled with their chutney, we just couldn’t get enough. One plate will cost you INR 60. This gem in Karol Bagh serves egg pakodas that are cooked (read; fried) to perfection and served with onions and mint chutney that balance the taste well. Read more about the place here. 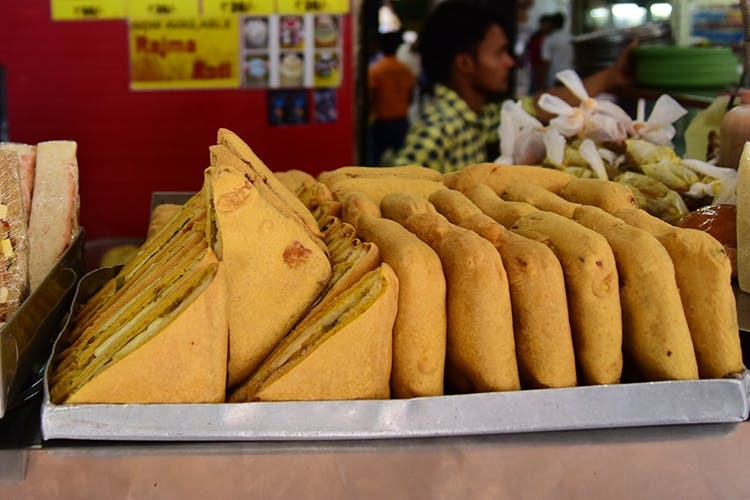 You’ll love the crunchiness of their pakodas which are available in ample variety (from plain, bread, paneer, gobi to aloo, they’ve got them all). This place serves them by the kilogram, and you can read more about them here. A beautiful open-air space, steaming filter coffee and of course a plate of delish assorted pakodas and we’re sure you’ll never want to leave this place. Their plate has six pieces and costs just INR 68.